Zen Cart Follow-up Autoresponder is a COMPLETE automatic email follow up system, to get your store marketing to next level. When someone makes order, requests information from your store, web form, newsletter or whatever, your autoresponder software will send out a preset reply instantly and then follow up with the new prospect with emails sent at timed intervals you set- hours, days, weeks – you decide. 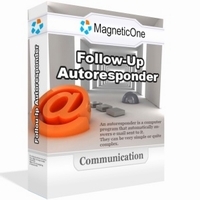 Make life easier, maximize your profits and save time – by putting your marketing on auto pilot with Follow-up Autoresponder. It has even more then you need, really. Recommendations based on Previous Orders – This is the killer feature, your future killer advantage!. You can include products that are recommended to buy with the products that customer already ordered (i.e. cross-sell, related to the products that customer already ordered), customers who bought this also bought etc. customer opens account in store – yes! customer fills contact form – yes! customer makes FIRST order – yes! customer makes SECOND order – yes! customer does ACTION that you define – yes! order status changed – yes!